Aloha friends! 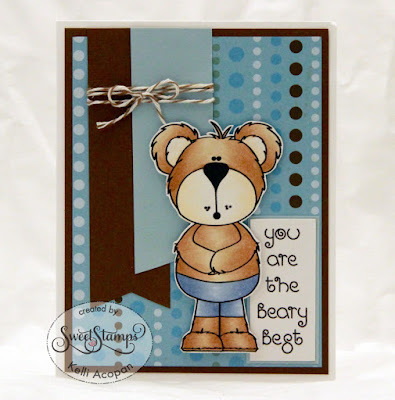 kel here sharing a simple card perfect for a little guy!! This is the Beary Best clear stamp set in the Sweet Stamps store. He is just too cute. I wanted to keep this card on the masculine side so decided to keep it really simple and without a lot of patterns or embellishments.. just a simple baker's twine bow around some solid colored banners to keep it all together!! He is so cute, I love how you matched the coloring on the bear to the paper colors. Cool design with the banners and twine accent.